St Mary is one of the great small town churches of England, although it must be said that Attleborough is not one of the great small towns. If you are expecting another Wymondham, or even a Dereham, then you will need to readjust your sights; Attleborough is on a much smaller scale, and there is no fine historic centre here. 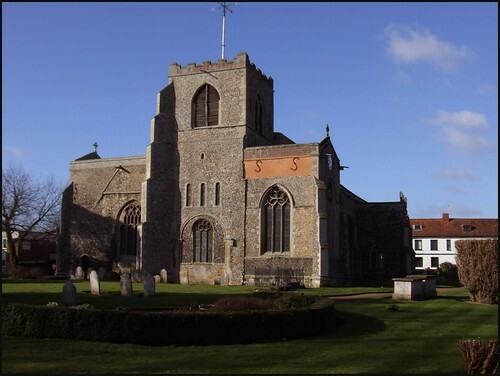 But if you have visited Dereham's church of St Nicholas, then you will have some idea of what to expect at St Mary. This is a similarly large cruciform church, but the exterior of the building is a little unusual, and takes a moment to comprehend. The chancel has been demolished, and the transepts are so long that, seen from the east, the building appears as if you are looking at it sideways on. This was a great Norman church, and this is still plain to see from the tower. In fact, the chancel had been demolished before the Reformation to be replaced by a college of Priests, which was then itself taken down within fifty years. A rebuilding of the nave in the 14th century leaves the church looking as it does today. As at Dereham and Wymondham, the tradition here is resolutely Anglo-catholic, but the feeling of the interior is much more rustic than at those other two great churches. Here, the brick floors stretch in all directions, and the elegant arcades rise like a forest from a sea of modern chairs. The effect is delightful. The nave is a vast, light, cavernous space, although, at first, the cruciform origins are lost to view. This is because, facing east, you are presented with East Anglia's longest rood screen. It runs right across the church from one wall to another, and rises high to its original coving. It dates from about 1480, and has had a colourful history. About sixty years after its construction it was whitewashed, and improving quotations from the Bible were added by the serious-minded Elizabethans. In the early 17th century, the arms of the various Bishoprics of England and Wales were added in a run along the top. Then, at the time of a restoration in 1842, it was sold to a Norwich antique dealer for £40. Presumably, he was hoping to make a quick sale of it as an adoornment to one of the new 'Gothick' country houses which were springing up everywhere. However, this was the time of the rise of the Ecclesiological Movement, and Mortlock records that the Bishop of Norwich refused to allow the sale to go through. The parish removed it, and dumped it at the back of the church, where it remained until 1932, when it was restored and reinstated. Above the crossing arch is one of Norfolk's most singular wall paintings. It is on three levels, and would originally have provided a backdrop to the rood. At the top are the remains of an Annunciation. In the middle row, prophets and angels cense the vanished crucifixion. At the bottom are the Blessed Virgin and St John, with two more censing angels. Perhaps the most remarkable feature of the Attleborough screen is the sequence of life-sized figures on panels either side of the central opening. To the north, these are St John the Baptist and St John the Evangelist flanking the Blessed Virgin and Child. On the south side are St Thomas of Canterbury and St Bartholomew flanking the Holy Trinity: God the Father is seated with the crucified Son between his knees. Above Christ's head, the Holy Spirit descends as a dove. The space beyond the screen is shadowy and enclosed, as if you had entered a series of rooms which unfold before you. In the south transept is a locked vestry, but beyond the screen you can make out an excellent window depicting the Adoration in the south window. Presumably, it is by Powell & Sons. It has to be said that much of the 19th century glass at St Mary is pretty dreadful, especially that on the south side of the nave. The figures appear wooden, and the Annunciation scene depicts Mary as a crabbed older woman. Although the sanctuary itself is nicely done, a simple space between massive fluted pillars, on this Saturday morning lit by candles and the sanctuary lamp, it is something of a relief to step back through the screen and into the nave again. Here are a few curiosities. The massive lectern is cast iron, and the steps leading up to it are set on two massive serpents. The late medieval font is elegant enough, but as Mortlock records, it is of historical interest because it was originally at Booton, and then when the church there was rebuilt it was removed to St Mary Magdalene at Sprowston in north Norwich. Now it has found a new home here. On the south side of the nave is the remains of a St Christopher, above the door that forms the way to the modern church office. Nearby is a most odd 17th century poorbox. Wedged with massive oak beams between pillars, it is going nowhere.